The colorful past of the 1929 Baker Hotel in Mineral Wells includes a hotbed of activity with tourists and celebrities like Clark Gable and Judy Garland, who flocked to the grand resort for the medicinal virtues of the town’s mineral-rich “Crazy Water.” The outpost west of Fort Worth in rural Palo Pinto County boasted luxurious accommodations and the best in entertainment from Lawrence Welk to Pat Boone. It was also home to Bonnie and Clyde and the rump shaker, but more on that later. Judge J.A. 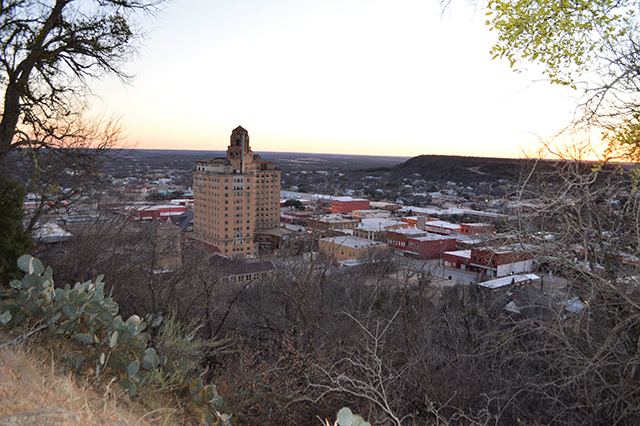 Lynch founded Mineral Wells in 1881 after discovering the medicinal properties of his well water. The town quickly developed a reputation for its healing waters and attracted many from afar seeking to cure their ailments. An early well in the town was named the “Crazy Well” after a woman suffering from a nervous breakdown was supposedly cured by the water. The “Crazy” name stuck, and soon there was a Crazy Hotel, Crazy Drinking Pavilion, Crazy Theater, Crazy Bottling Plant, Crazy Gang Radio Broadcast, Crazy Box Factory, and more. In 1925, Mineral Wells leaders called on T.B. Baker, a successful hotelier in Texas, to build a grand resort-style hotel to take advantage of the city’s healing waters. Baker owned hotels all over Texas, including the Menger and Gunther in San Antonio, The Stephen F. Austin in Austin, The Texas in Fort Worth, The Goodhue in Port Arthur, The Galvez in Galveston, The Edison in Beaumont, The Sterling in Houston, and The Baker in Dallas, unfortunately demolished in the 1980s. 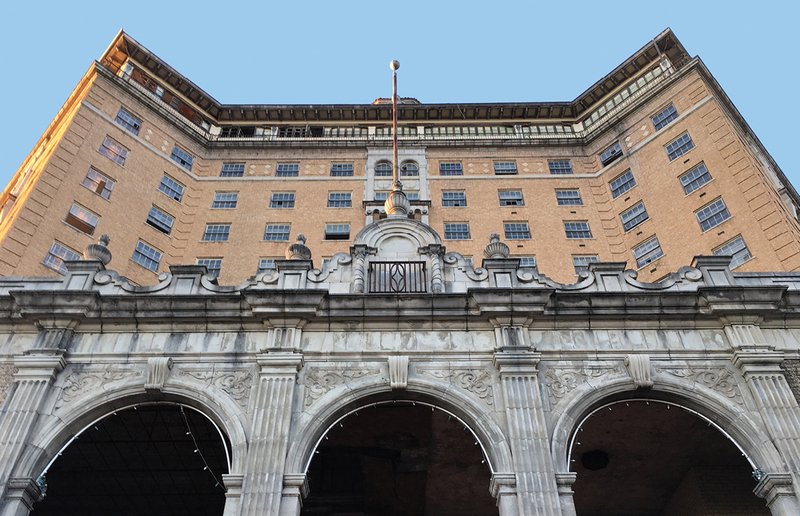 After visiting the Arlington Hotel in Hot Springs, AR, Baker liked the design so much that he hired its architect, Wyatt C. Hendrick of Fort Worth, to create a near copy of it in Mineral Wells. Construction on the massive 12-story structure, with 450 rooms and 250,000 square feet, started in 1926. Poured-in-place concrete was used for the structural system of the $1.25 million hotel. The new hotel was Spanish Colonial Revival in style, just like the Hot Springs version, with yellow brick, red clay tile roofs, decorative iron work, arcaded loggia, and a 40-foot bell tower on top. The design featured an elevated ground floor with a monumental staircase leading to the two-story, triple-arched portico for the entrance to the grand lobby. Off the portico were grand loggias covered in clay tile wrapping around each side of the hotel. The raised design also allowed for commercial spaces at the street level along the perimeter of the building. To give wealthy visitors arriving by car a sense of intimacy and luxury, there was a walled motor court behind the hotel with a brick courtyard and a loggia hotel entrance. 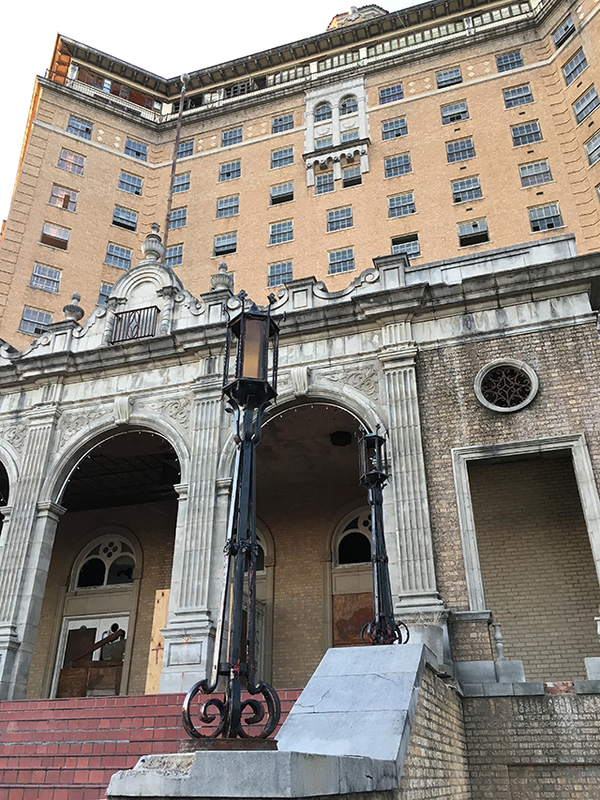 On Nov. 22, 1929, the Baker Hotel held its grand opening, drawing considerable press in the Fort Worth and Dallas newspapers as a major social event of the year. The hotel, in a town of only 6,000 at the time, provided incredible amenities befitting a world-class resort of the day. 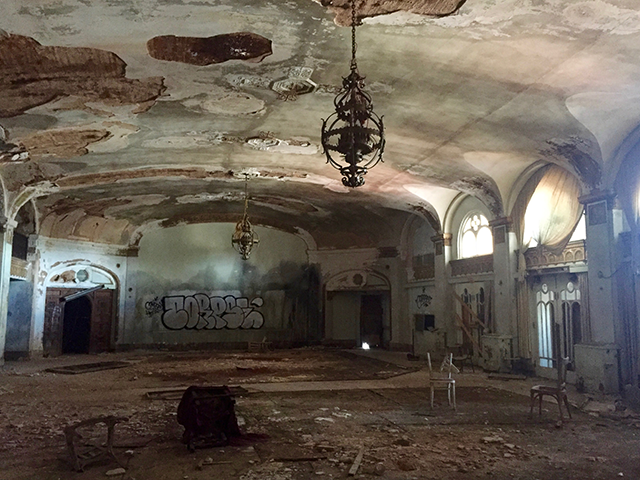 There was a large two-story grand lobby, dining area, bar for imbibing the mineral water, a grand ballroom on the top floor called the Cloud Room, and meeting spaces to hold 2,500. A gymnasium, bowling alley, spa treatment center, Olympic-size outdoor swimming pool, and a 117-acre golf course were available for the health conscious and active types. For those who came for the mineral water’s healing properties, there was an extensive spa area and even doctors on site to prescribe a course of treatment. Spa equipment featured the trends of the day: a leg gyrator, a bun-splitter, a rump shaker, and a colonic machine. The hotel’s signature Baker Bath included a hot tub with the hottest water a guest could stand, followed by a rubdown with salt, then sitting inside a box heated by electric lights while dipping feet into a hot water basin and sweating away the toxins. A cold shower, to get the blood pressure down, completed the bath. Despite the Great Depression, the hotel was still a draw for the wealthy, who came to relax and enjoy the health benefits and entertainment. Besides those coming from nearby Dallas and Fort Worth, many a celebrity stayed or performed at the hotel. Early in his career, Lawrence Welk was a hotel band leader. Other entertainers who performed there included Mary Martin, Guy Lombardo, Dorothy Lamour, Sophie Tucker, and Herbie Kay. In addition to Gable and Garland, Jean Harlow, Will Rogers, Marlene Dietrich, Roy Rogers, and the Three Stooges stayed as guests. Politicians such as Lyndon Johnson and Sam Rayburn also came to the hotel. The most infamous guests were outlaws Bonnie and Clyde, who stayed there for a time and even tipped a waiter who brought food to their room $2, big money back then. In 1952, T.B. Baker transferred his hotel holdings to his nephew Earl Baker, who had extensive hotel experience and a dominant role in the company. The hotel declined in service and guests with the changing times of the 1950s and ’60s, and Earl kept it open until 1963. 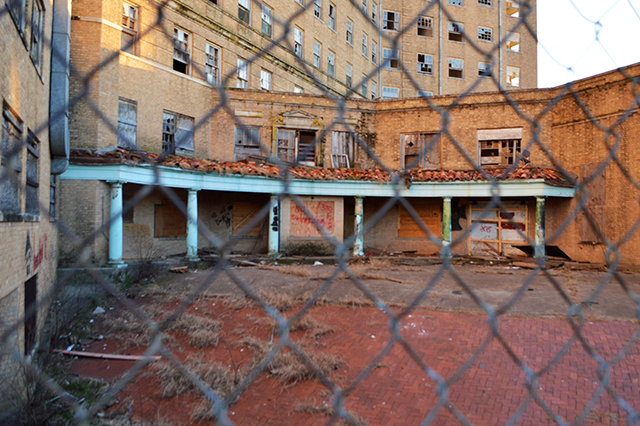 The hotel’s closing devastated Mineral Wells. More than 200 people lost their jobs, the money that visitors spent in town dried up, and social life faded without the hotel’s entertainment and the metropolitan touch of big-city visitors. The hotel went to auction in 1963, but there were no takers. In 1965, a group of local leaders desperate to revive the hotel formed a corporation to purchase it. The Baker reopened but struggled from slim profits and changing ownership, resulting in its closing for good in 1972. Since then, the Baker has sat vacant and decaying. While the structure is solid, the interior shows the ravages of time with falling plaster, the remains of animals that died after seeking refuge inside, roof leaks that have eaten away at the upper floors, and vandals who have stripped wiring, plumbing, and anything else of value and tagged the interior with graffiti. 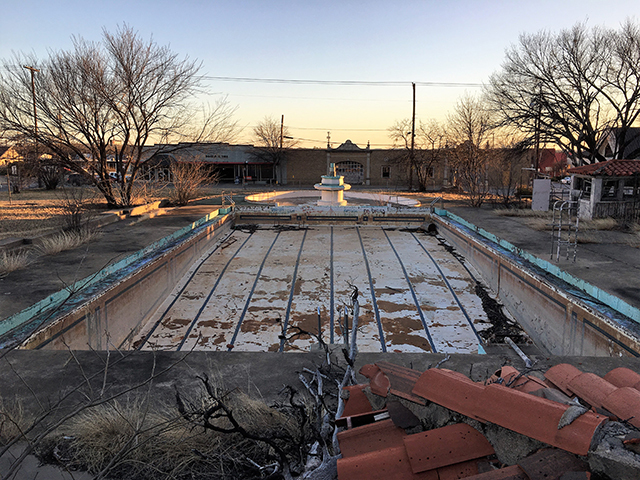 The once meticulously manicured yard surrounding the grand pool is now overgrown, and the pool holds puddles of murky rainwater in the deep end—a far cry from the mineral water that once filled it. 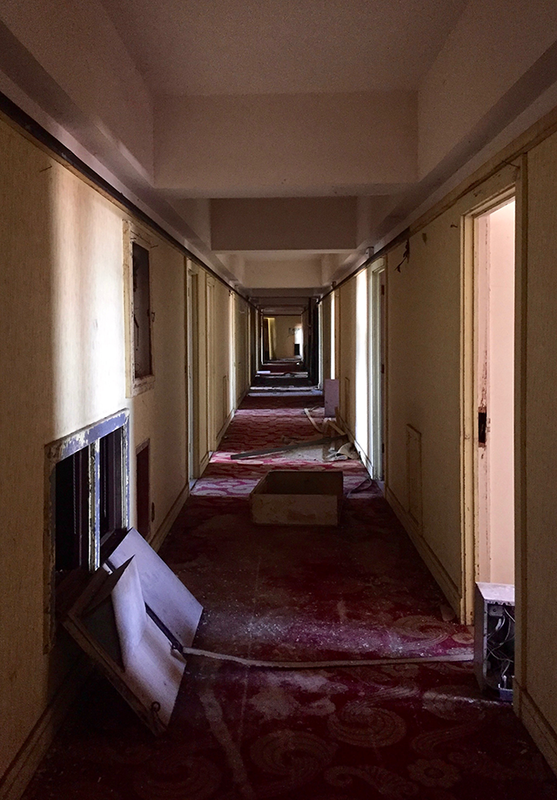 Various attempts to resurrect the hotel with redevelopment have fallen through, given the tough job of making the economics work for such a large property in a town of only 16,000. 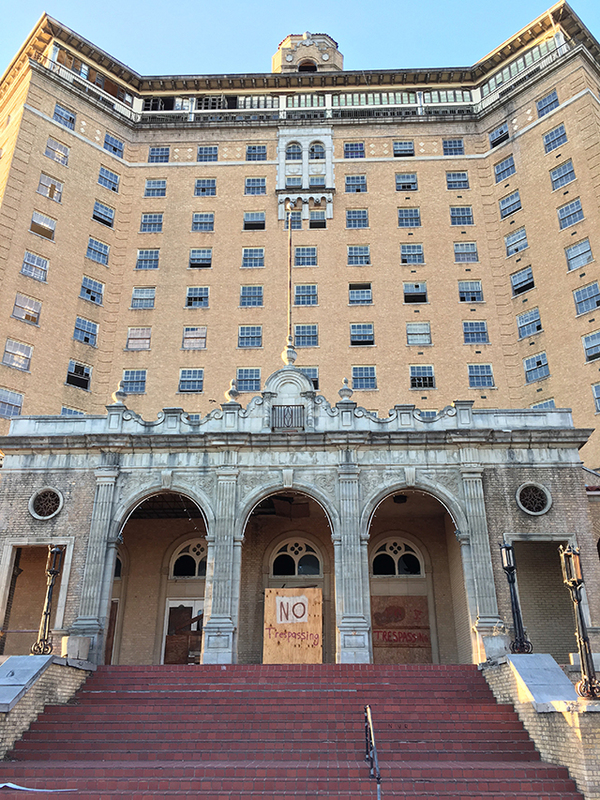 Even worse, there are other vacant buildings nearby, including one- and two-story commercial buildings, the six-story 1927 Crazy Hotel, and the six-story 1931 Nazareth Hospital. The Baker was definitely a product of its time and the craze for finding the cure to ailments in the supposedly healing mineral waters. The hotel could use some of that famous Crazy Water now to resurrect its glory and remedy its vacancy ills.